Gold Nugget Buying Tips. How to Value Natural Gold Nuggets and Specimens. In this article, I want to touch on a few of the common questions I get regarding buying and selling gold nuggets. I would also like to offer some advice to avoid disappointment when you decide to buy a gold nugget. "How much is a gold nugget worth?" "Why are your nuggets priced higher than spot price?" "I've never bought a gold nugget before, what should I look for when buying?" These are some of the most often asked questions by new gold collectors. To give an educated answer to these questions, we first need to discuss the variations in gold nuggets that make each piece of gold unique. 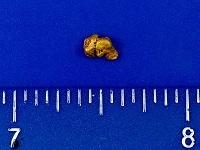 The size of a gold nugget is probably the first thing most people consider when valuing a gold nugget. The larger a nuggets is, the rarer it is. An interesting fact is that 98% of the gold that has been mined from Earth did not come in the form of a placer gold nugget. Most gold has been recovered my lode mining, by blasting it out of the rock. It is often so small that it can not even be seen by the naked eye (micron gold). The most common size of gold is very fine, often referred to as gold dust. These are tiny specks of gold that you might find if you were to gold pan in a creek. It might take thousands, or even tens of thousands of pieces of gold dust to make an ounce of gold. 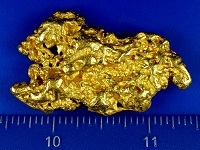 The next size is often called a "picker" or "flake" of gold. This is a piece of gold that is big enough that you can pick it out of a gold pan with your fingers, and if you drop it in your gold pan you will hear a "tink" sound when it hits. Next you get gold big enough to be classified as a gold nugget. Since there is no official breakdown of sizes between dust, flakes, pickers, and nuggets, these sizes are open to interpretation. I personally consider a piece of gold to be a nugget when it exceeds 1 gram in size, but this isn't an official designation. 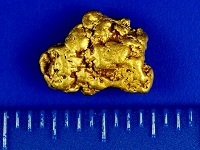 The rarity of a gold nugget increases almost exponentially when you increase in size. For every 1 ounce nugget out there, there are probably hundreds of 10 gram nuggets, thousands of 1 gram nuggets, and literally millions and millions of pieces of gold that would classify as gold dust. This goes to show you how rare a large gold nugget really is. If you doubt this, just ask a gold prospector how many 1 ounce nuggets they have found. There are many gold prospectors out there who have mined all their lives and NEVER found a 1 ouncer! Assuming these were both the same size, which would you prefer? Would you pay a little bit more for the nugget on the right? To me, the nugget on the left is just a piece of gold. It's just not very attractive. The nugget on the right is gorgeous. It is bright and clean with a nice shape and great eye appeal. This is a very important thing to consider when buying or selling a nugget. Which would you prefer to buy if you had the choice? The specimen on the left has a brown, rusty colored host material, and the gold itself is kind of dull. Not very attractive. The specimen on the right has nice bright gold, clean white quartz, awesome matrix and and great "eye appeal". Would you pay a little more for one than the other? New gold collectors often ask, "Why would I want to pay for all that quartz? I want the gold!". This is fine, as some collectors prefer clean nuggets with no rock inclusions. Others prefer the beautiful matrix of gold in quartz. It is a personal preference, just remember that you are buying a gold nugget as a collectable item, not just for it's value if you were to melt it down. If you just want gold for it's gold content, you are better off buying bullion instead. If you enjoy them for their natural beauty, then gold nuggets and gold specimens are for you. Which one looks bigger to you? 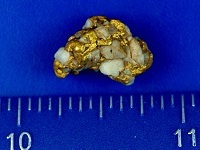 This is the same gold nugget and it is worth about $15. With no size reference, a quarter gram nugget can look like a 5 ounce nugget. Just remember that a quality camera can make a speck of gold look like a monster! 24 grains = 1 pennyweight (dwt.) 20 dwt = 1 ounce Troy 12 ounces = 1 pound Troy 5760 grains = 1 pound Troy 480 grains = 1 Troy oz. You will see all of these units of measurement used from time to time. Notice that grains and grams are both units of measurement to weigh gold. If you see the abbreviation gr., be very careful! More times than not this will be a shady seller trying to fool you into thinking a gold nugget is bigger than it actually is. Also be aware that all precious metals should be measured in Troy Ounces, not the commonly used Avordupois ounce. Pennyweight(Dwt.) is also commonly used. Learn and understand these weights and conversions and you will avoid a lot of disappointment. Another thing I have noticed is regional interest for gold nuggets from certain areas. A collector might be more interested in a quality gold nugget from California because they used to live there, and willing to pay a premium for a nice nugget. Right now there are several shows on TV about gold mining in Alaska, and some folks want a genuine Alaskan gold nugget. 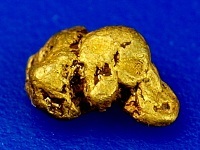 Australian gold nuggets are known for their high purity and unique shapes, and command a premium to some collectors. To summarize, there really isn't one correct answer to the value of a gold nugget. While the spot price of the metal is certainly a starting point, the true value can vary greatly based on the factors discussed above. I remember my Grandpa would always say "Something is only worth what someone is willing to pay for it," and I think gold nuggets are a good example of that. Here is an amazing 1.5 ounce gold nugget from Australia. Would you value this gorgeous nugget at melt price?